Law and government are major areas of web archiving at the Library of Congress, and feature prominently among the event and thematic collections available on loc.gov. The Law Library, which holds the largest collection of legal materials in the world, also coordinates the collection of Law websites through five significant collections: the Federal Courts Web Archive, the International Tribunals Web Archive, the Legal Blawgs Web Archive, the United States Congressional Web Archive, and the recently released Foreign Law Web Archive. These collections represent over 1,500 web archives, many of which are part of the 4,240 recently released new web archives across 43 event and thematic collections. I spoke with Robert Brammer, Senior Legal Information Specialist at the Law Library, to learn more about the new Foreign Law Web Archive. In addition to creating web archive collections for the Law Library, Robert serves as a subject matter expert for the development of Congress.gov, built the Law Library’s Facebook Messenger chatbot, and is a member of the In Custodia Legis blog team. Robert explained that the Foreign Law Web Archive is comprised of foreign legal materials, including online gazettes and judicial websites. It is important to collect these because many foreign legal materials are now posted online, with some jurisdictions dispensing with a print publication entirely. 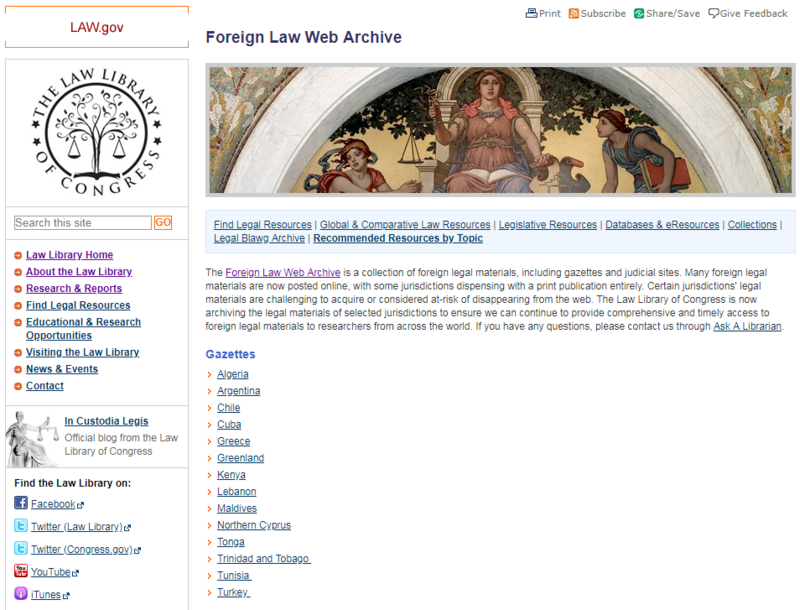 A screenshot of the landing page for the Foreign Law Web Archive. The Law Library came up with the idea for the new collection when their foreign legal specialists noted that certain jurisdictions’ legal materials are challenging to acquire or are considered at-risk of disappearing from the web. Robert worked with the experts to select jurisdictions to be collected and archived. The new collection ensures that the Law Library of Congress can continue to provide comprehensive and timely access to foreign legal materials to researchers from across the world. Indeed, the highlight of this collection isn’t any one website, but rather the spectrum of content from a diverse array of countries. Now the Library of Congress can make sure these resources will be available for future generations! This is a syndicated post. Read the original at The Signal 2018-10-22. ← Do we need to “fail fast” to achieve open access?